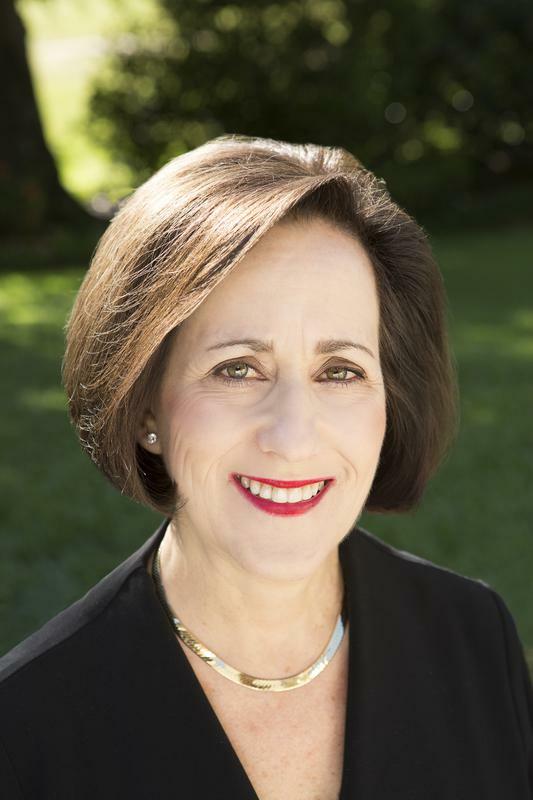 LET YOUR COTM REALTOR REFERRAL -- Melanie Susman -- HELP YOU FIND YOUR PERFECT HOME! 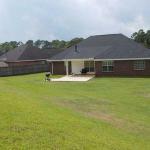 Coastie owned beautiful 3 bedroom 2 bath 1734 sq ft home. Vegetable garden, fruit trees and flower gardens in bloom. Brand new kitchen & windows. Very large outdoor entertaining space with koi pond. 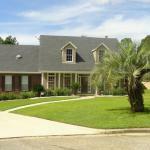 Home is located on canal that leads to a 480 acre private lake. Large back yard partially fenced. Home also comes with 2 boats: peddle boat & 10’5” Boston whaler. A short drive to Free shuttle to take you to New Orleans District 8. Very convenient to ATC Mobile! 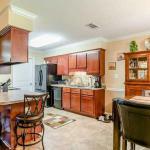 It is a 3/2, 1858 sqft, priced at $169,500. with a large LIVING ROOM area with the master on one side of the home and the additional bedrooms on the other for extra privacy. Airport Blvd. 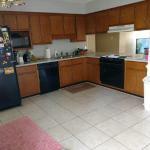 this house is a great find for anyone looking to be close to schools, shopping and restaurants. Kendall Court. House is on the left. 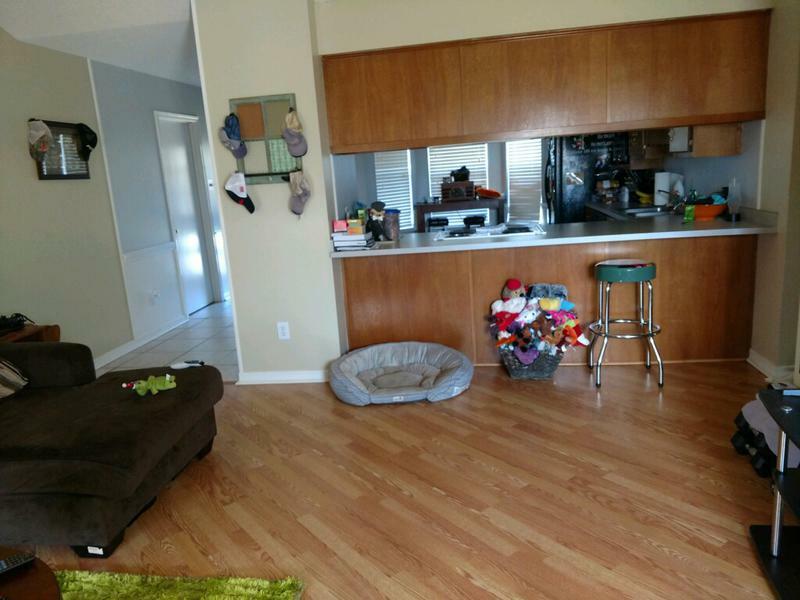 Vacant and super easy to show. 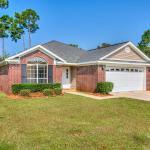 Spanish Fort school district 4 bedroom w/bonus room. 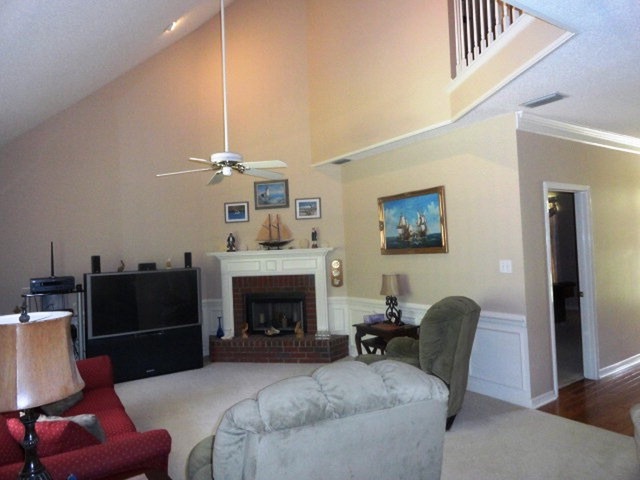 Vaulted ceiling & fireplace in livingroom Great open floor plan with large master bedroom on main level. 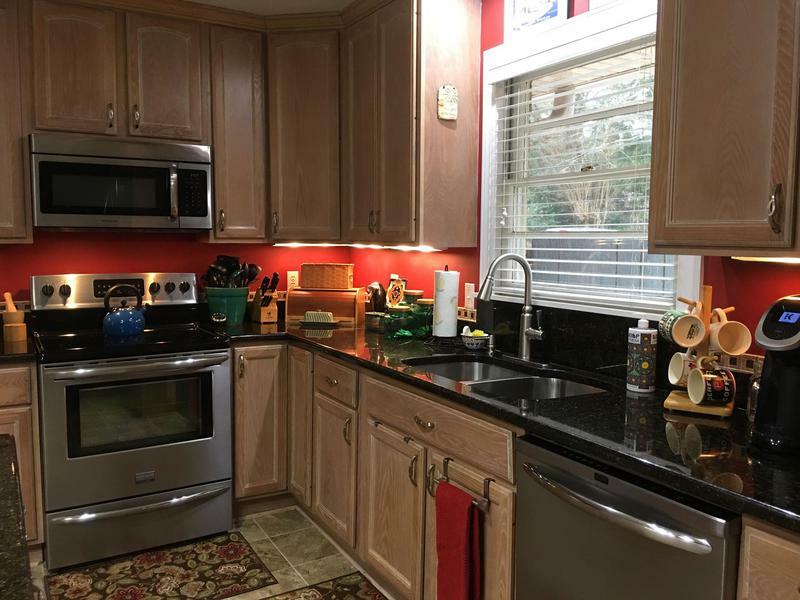 Kitchen has granite counter tops, eat at bar, pantry and opens to oversized breakfast area complete with built in and window seat with storage. 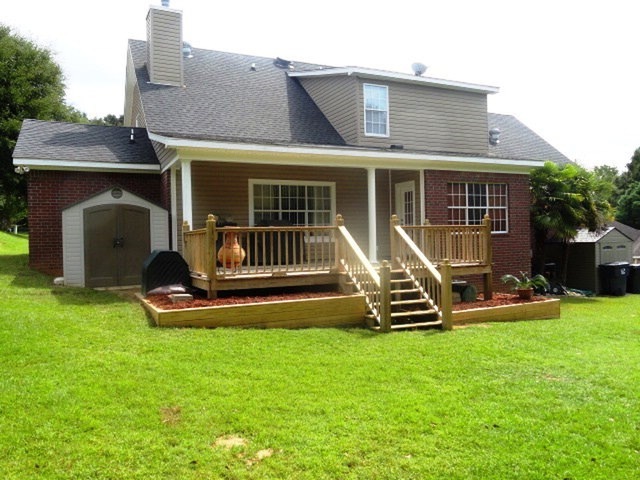 Spacious back yard deck and two outside storage units. Contact garrettsantos@gmail.com for more information. 12 minutes from ATC Mobile and 34 minutes from Sector Mobile. Located in a quiet cul-de-sac with minimal traffic, great for kids. 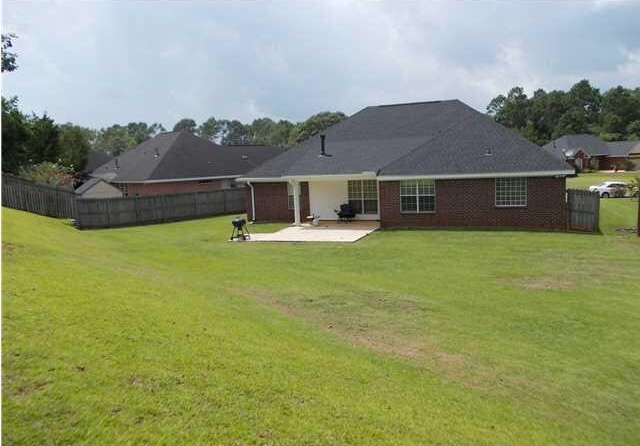 1300 sq foot 3 Bedroom/ 2 bath home with single car garage located in Oakridge West subdivision off Airport road in West Mobile. 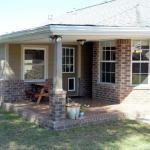 Home has tile floors in the bathrooms and kitchen, laminate wood flooring throughout the house and master bedroom. The 2 spare rooms have carpet. Home has a brand new roof that was installed 1/19. Privacy fence surrounds the property with additional covered parking through a double gate on the side of the house which is perfect for another car or boat. Property is approximately 3/4 cre. 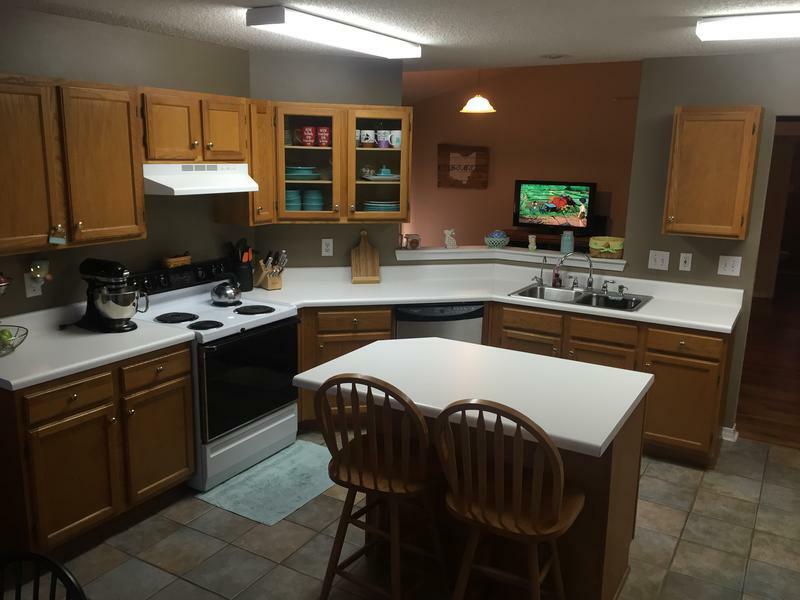 It is approximately 10 miles to ATC Mobile, 22 miles to Sector Mobile and 37 miles to Pascagoula, Ms. All appliances stay with the home including washer and dryer as well as riding lawn mowing and other lawn equipment. 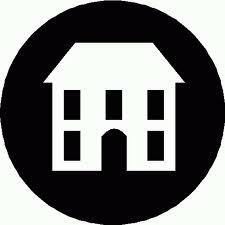 Home will be available June or July 1 depending on current tenants orders. Contact Tom Beaudry for more information on these homes! 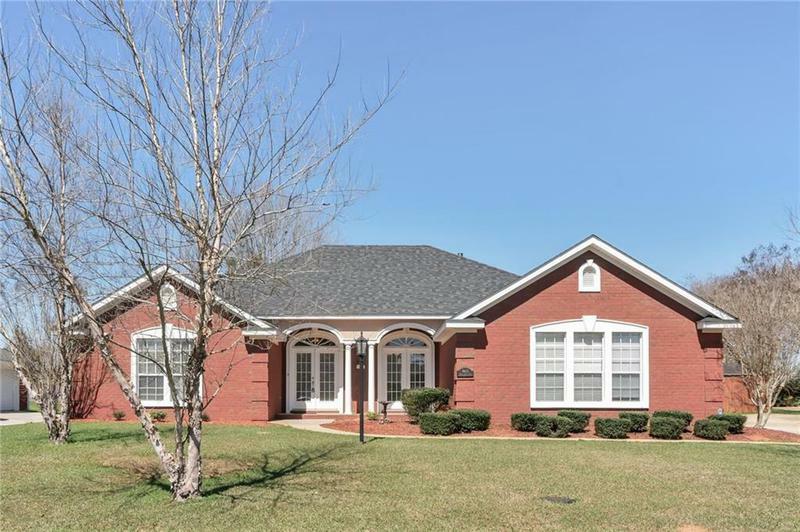 Charming Champion Hills neighborhood located between Mobile airport and I-10; perfect commute north to the ATC or south to Pascagoula stations. 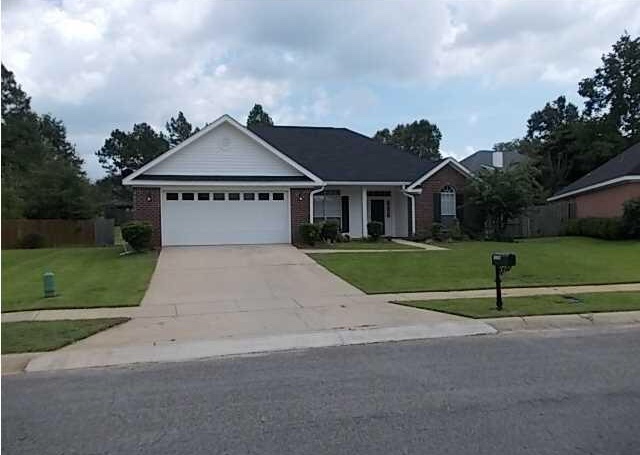 Beautiful well maintained home is move-in ready featuring an open & split floor plan with hardwood floors, high ceilings and crown molding throughout. 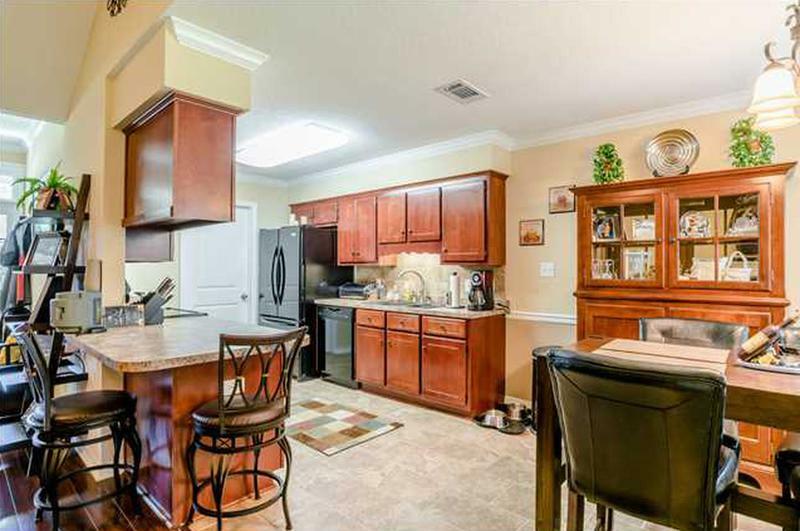 Kitchen has an island, granite countertops with kitchen seating area and stainless steel appliances (gas range w/ double oven). 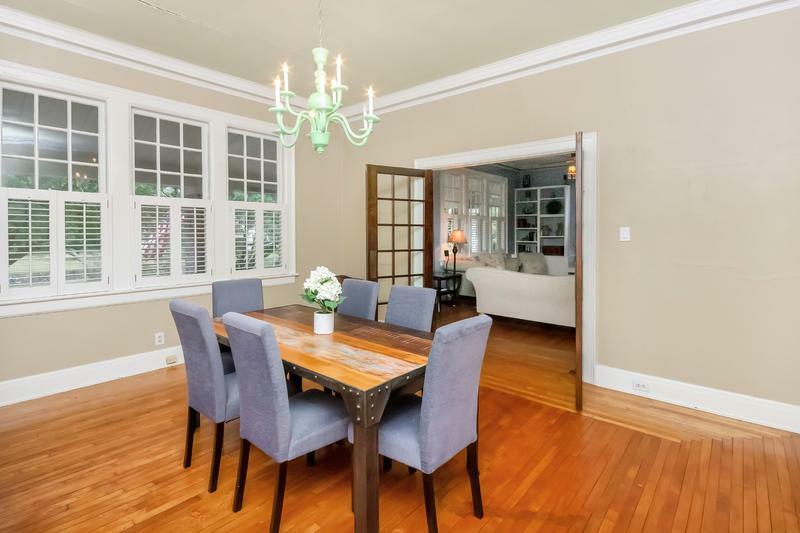 Enjoy meals in the dining area with oversized window views of adjacent woodland area and creek in back. Upgraded dimming switches and wood Venetian blinds in every room with custom Plantation Shutters in the front bedrooms. Double sinks in both bathrooms. 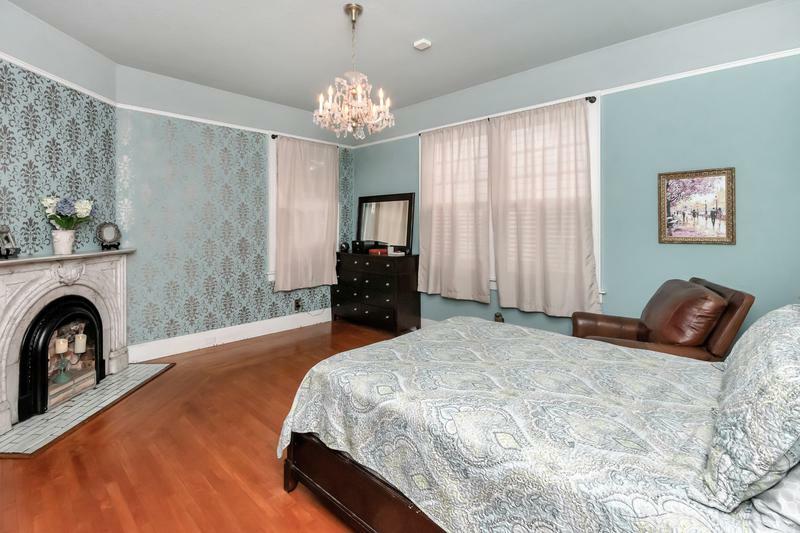 Spacious master suite with walk-in closet, shower and a garden tub. 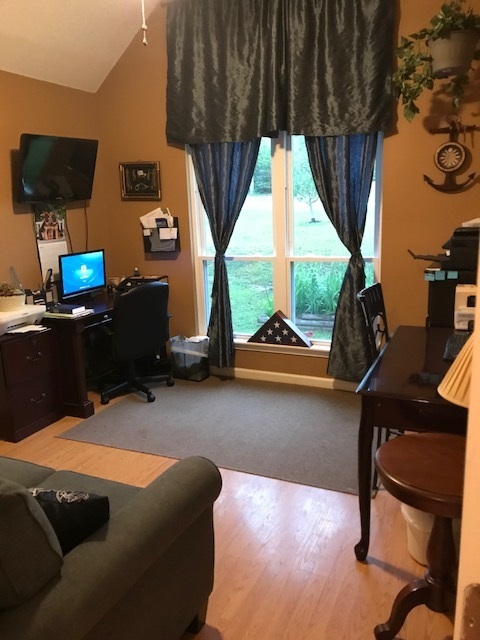 Working nook in garage and A/C is only 4 yrs old. Enjoy the private backyard in the screened back porch or on the newly renovated deck for outdoor eating while enjoying the wildlife views. - Brand new 30 year, 120 mph shingle roof installed in December 2017. - New paint throughout interior. 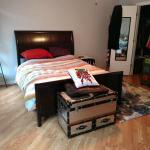 - New carpet in guest bedrooms. 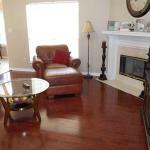 - New hardwood floors in master bedroom and office. 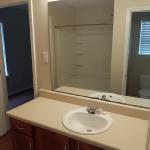 - 1953 sq feet and guest bathroom. 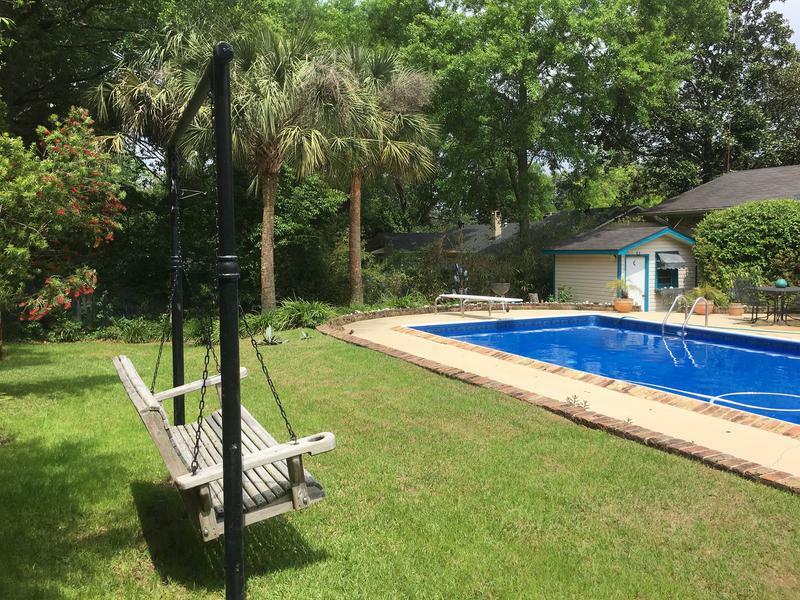 The house is located in the beautiful and historic Algiers Point neighborhood on what is called the "West Bank." For your reference, the majority of the City of New Orleans is located on the "East Bank" of the Mississippi with a small pocket of the West Bank being incorporated into the city limits- that pocket is Algiers Point! The two banks are separated by the Mississippi River and there is only one bridge crossing connecting the two sides (the other bridge is further up river and not very convenient for anything). 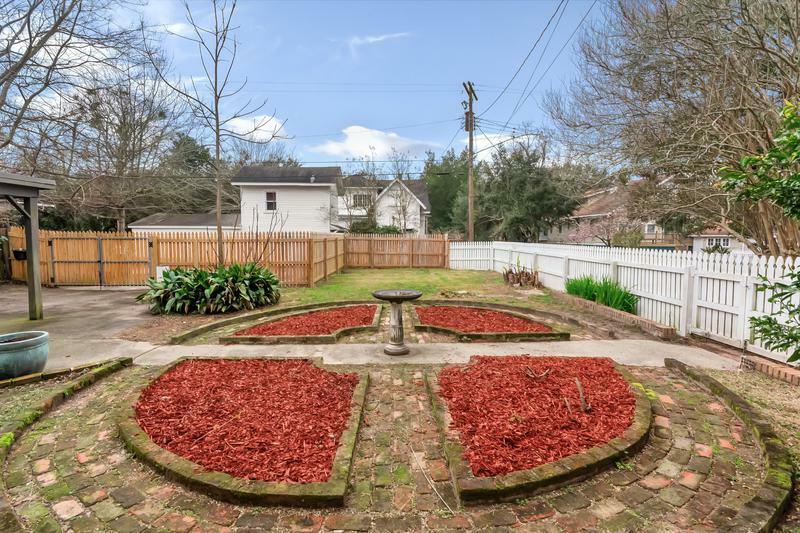 Algiers Point is a very convenient, quiet neighborhood that keeps you on the West Bank, avoiding the rush hour delays of crossing over the bridge, and maintains the architectural fun and "coolness" of the City of New Orleans! Our home is an 8 minute drive over the bridge to downtown or a 7 minute walk to the pedestrian ferry which will take you across the river and drop you off on Canal Street/ French Quarter for the low, low price of $2 per person. Well worth it if you want to go across and get crazy and then have the ferry bring you home! The NAS/JRB Air Station is a 25-30 minute drive with multiple routes to and from. The USCG Sector NOLA and Marine Corps MARFORES facilities are a 3 minute drive or 10 minute walk from us. The house is 1150 square feet, 2 bedrooms and 2 baths. 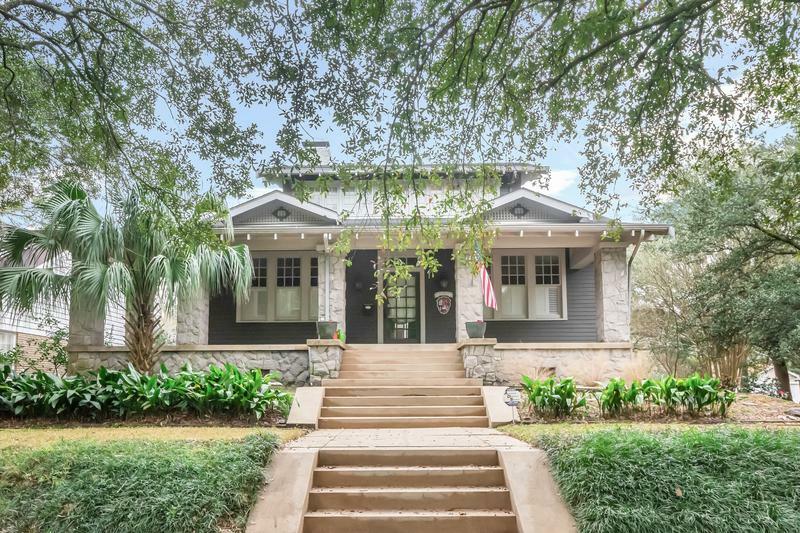 It is an historic home, probably built around the turn of the century, and was COMPLETELY renovated in 2016. 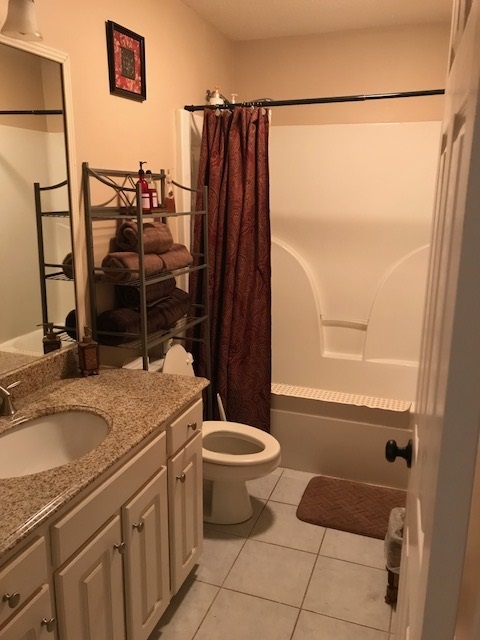 Marble counter tops, stainless steel appliances, original wood floors and tile throughout... the attached pictures will paint you a better picture. It's really nice. My wife and I love it and we're super sad to be leaving. 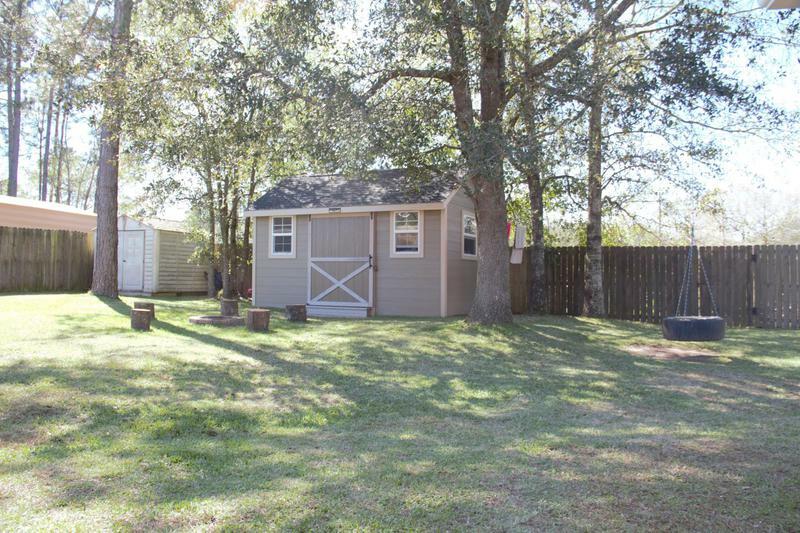 Picket fence in the front yard and 8ft tall privacy fence in the back with a nice-sized shed for storage/ work space. 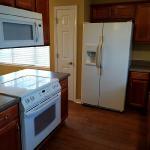 We will be including all of the appliances (washer and dryer too! ), security system with fire monitoring, and some other helpful extras for you like air-filter delivery and lawn service. 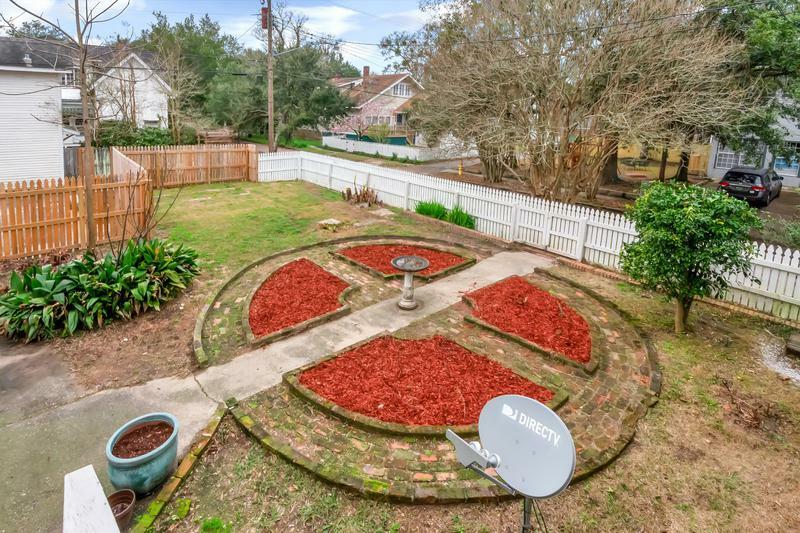 The home is listed for $1650/ month but I would be willing to come down to $1500/month for military if you agree to manage the lawn yourself and sign a 2 year lease. Thanks for looking and WELCOME TO NEW ORLEANS! Green built certified and guaranteed low cost utility bills! 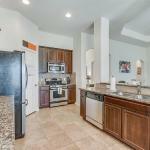 Property Description: Welcome to 3025 Cantabria in Barcelona Estates!! 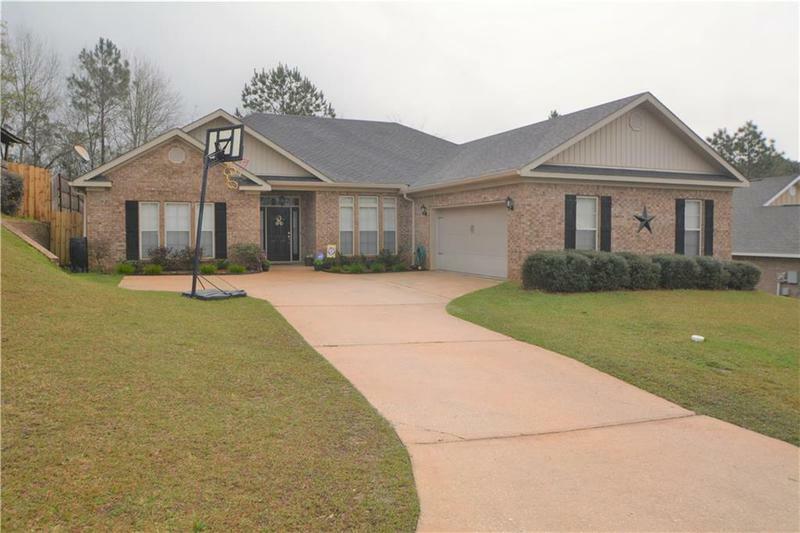 This beauty has an open floorplan with split bedrooms. 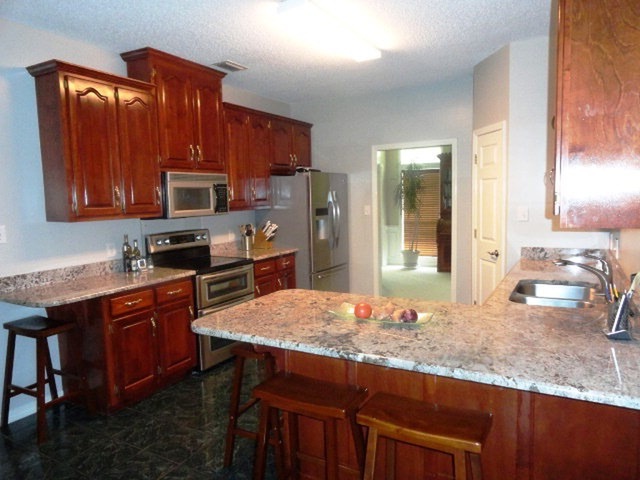 Kitchen is equipped with granite counter tops, tile backsplash and stainless steel appliances and a large island! 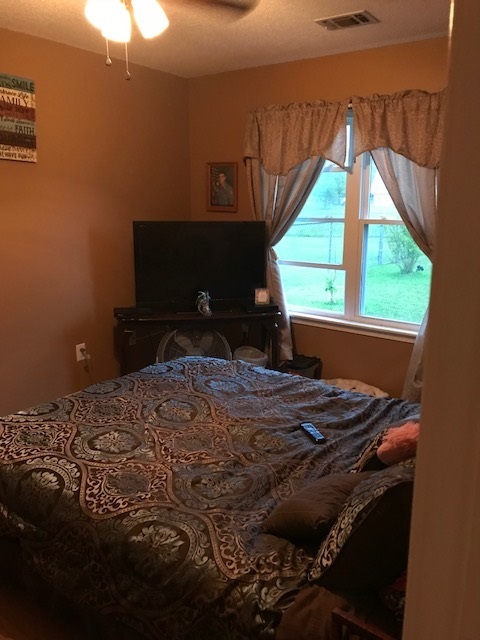 Great sized bedrooms with walk in closets. Master bath has double vanities with linen closet and a 3x5 tiled shower with rain shower head above!! 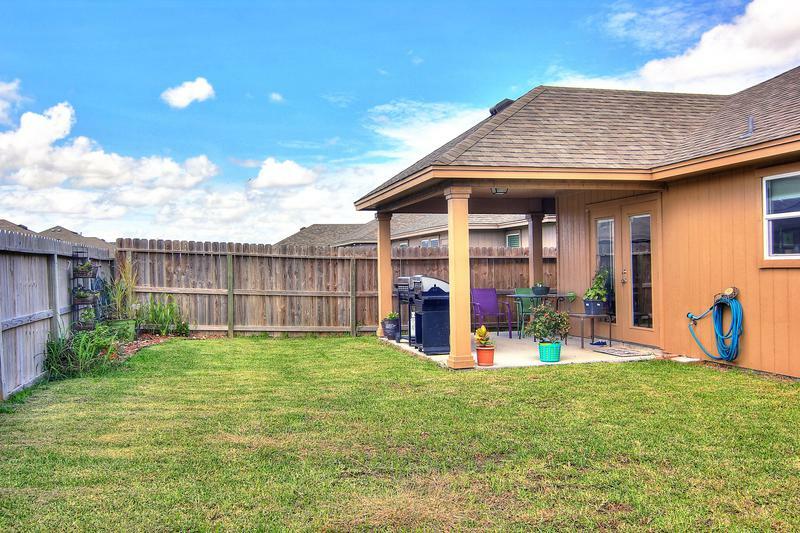 Walk out back to a covered wrap around patio, great sized yard perfect for entertaining!!! 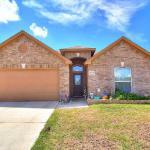 Walking distance to Galvan Elementary, conveniently located to shopping & freeway!!! 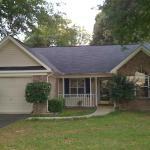 Beautiful move in ready 4 bedroom/2 full bath, 2174 sq. 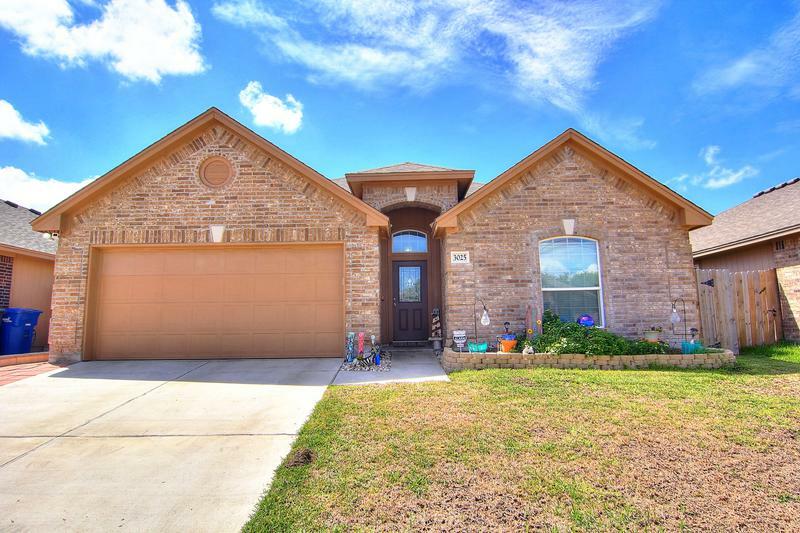 ft. home with a 2 car garage plus side entrances, with built in storage and work bench. 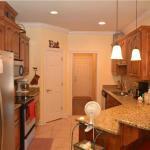 Master bath has large walk in closet, separate garden tub and shower, and double vanity sinks. 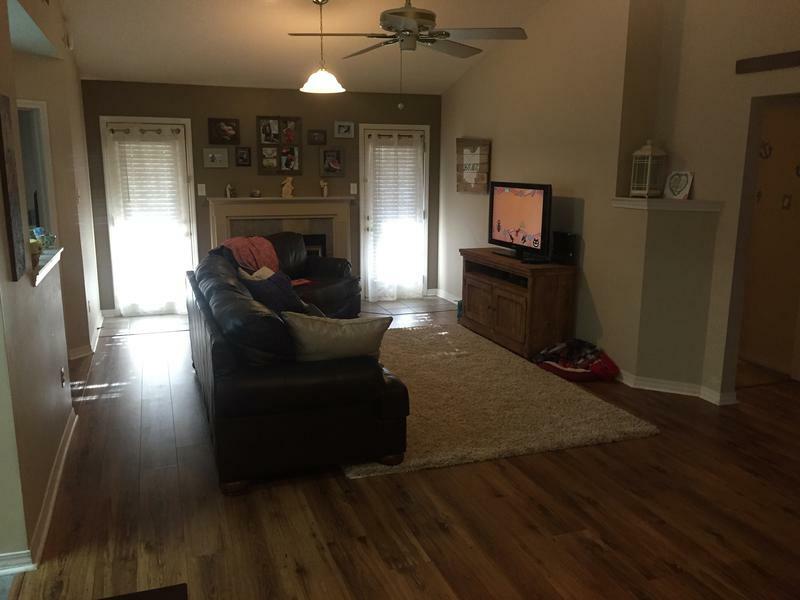 Split floor plan, hardwood and tile in living area, carpet in bedrooms, formal and informal dining area, gas fireplace in living room, covered back patio with gas hook up for a gas grill, and fenced in back yard. 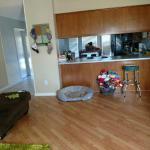 New wood laminate floor installed and new carpets will go in before the move in. Fresh paint with neutral colors. New AC unit installed recently will keep house cold in the Mobile heat, also, remote access to thermostat via any smartphone. Pet friendly for any outside pets only. Over a 450 sq/ft deck and patio. Great public and private schools nearby. 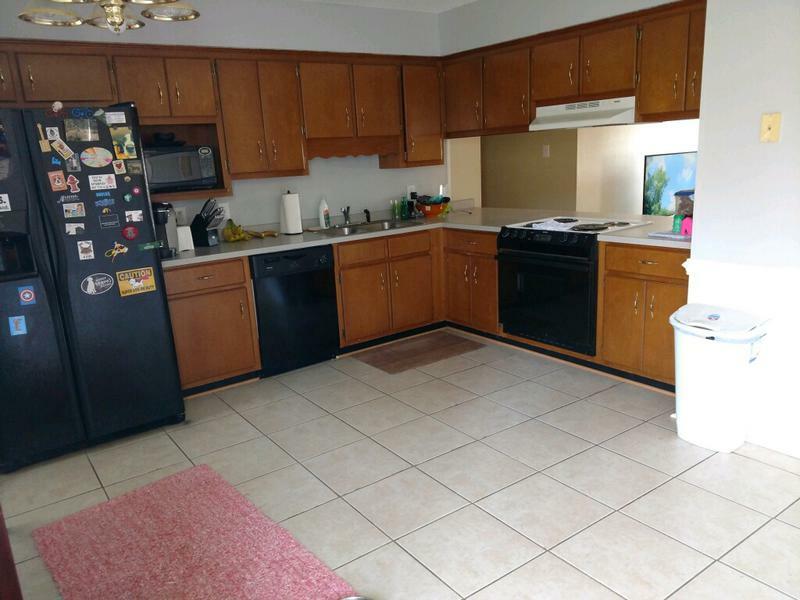 3 beds / 2 baths + bonus room. This is a 1,600 sq. ft house built in 2008 with an additional 200 sq. 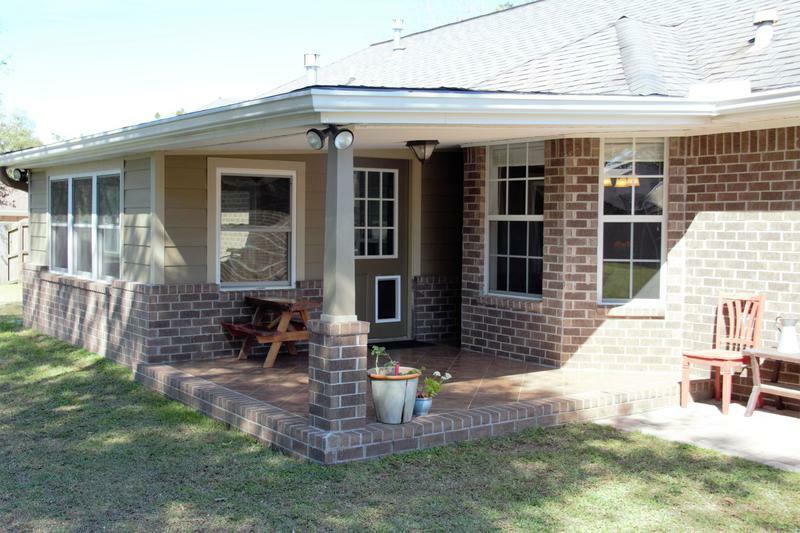 ft sunroom & attached 2-car garage. The garage also includes a 100 sq ft storage room. 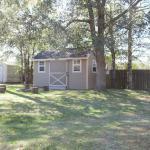 The ½ acre lot boasts a large backyard with a 170 sq ft custom-built workshed & 65 sq ft storage shed. The back patio is fully finished and provides a great place to barbeque while enjoying the firepit. There is a gravel parking spot behind the fence for added security. 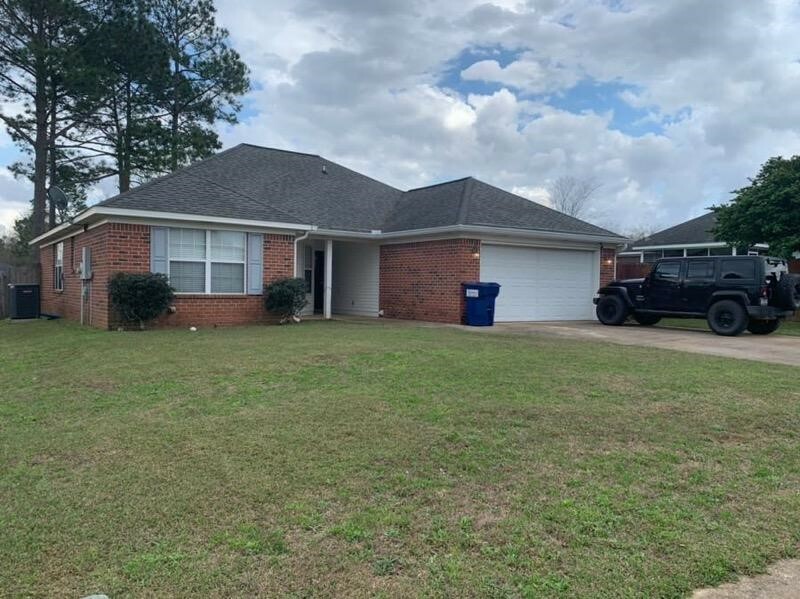 Located in the Southern Oaks neighborhood: 20-minute drive to ATC Mobile & easy access to I-10 for a short commute to Sector Mobile &/or Pascagoula. High ceilings in living room make for a spacious environment. 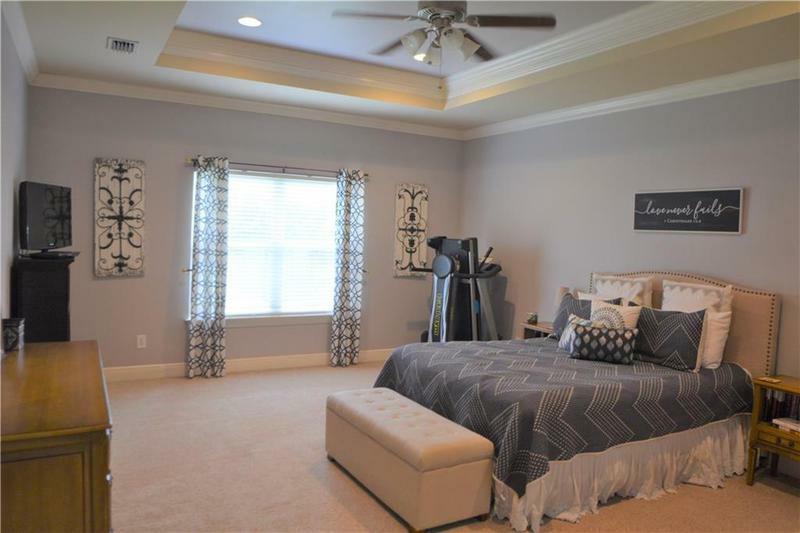 Master bedroom includes attached bathroom with duel sinks and duel walk-in closets. 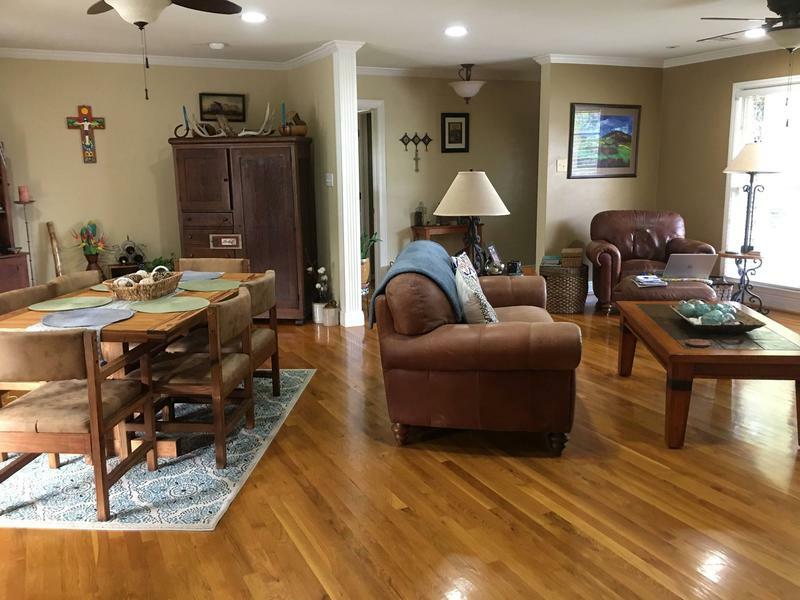 Engineered hardwoods throughout entryway, living room, hallway & dining room; tile flooring in kitchen, utility room, bathrooms, walk-in closets, sunroom, & patio; carpet in bedrooms. Energy-efficient LED lighting installed throughout the house. Electric bill ranges from $60 to as much as $140 in the heat of the summer, and averaging around $75. 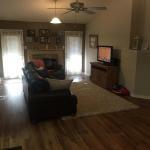 Piped in gas fuels living room fireplace, water heater, & central heat. Gas bill is typically $17 but can be over $100 during a cold winter month if you use the fireplace often. Well maintained house that will be ready for you in June. $1300/mo + $1500 security deposit. / Lawn care included in price./ No pets. For additional information, please contact: Justin Church at jmchurch422@gmail.com &/or 360.461.5516. 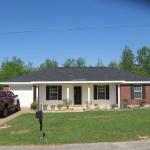 The house has three bedrooms, two baths, Living Room, Dining Room and a Laundry room, and Garage. 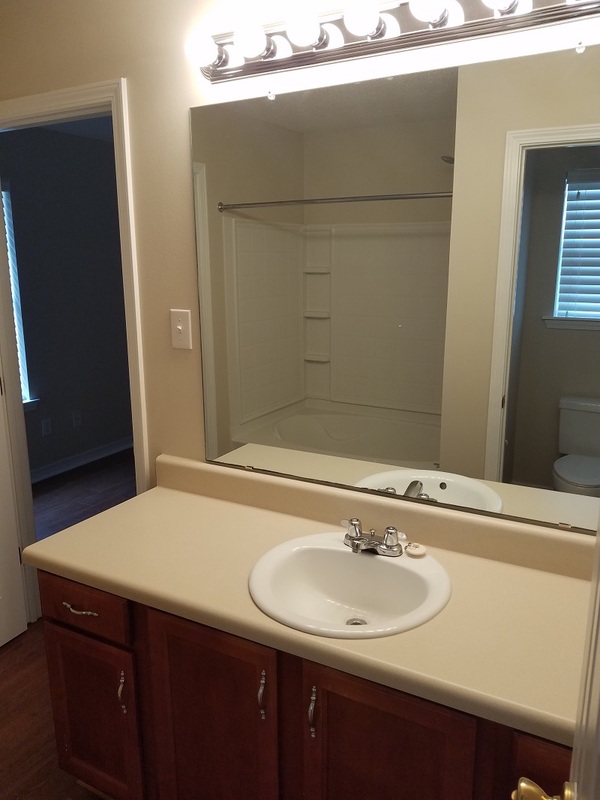 The Master Bath has a walk in closet. 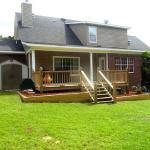 On the rear is a new cement patio and the backyard has a privacy fence. 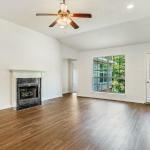 1463 SF. New paint and wood/ plank floors throughout. Kitchen has new Dish Washer and a new Microwave. 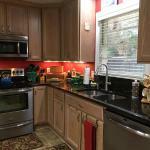 Water heater, range/ oven, and AC/heat are electric. 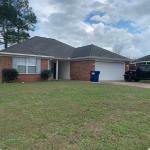 Located in West Mobile near Schillinger shopping complex, the Coast Guard Base, Regional Airport, Providence Hospital and a great school district more. Neighborhood has a fenced playground nearby. Additional photos upon request. Only $1,150 per month with good credit. 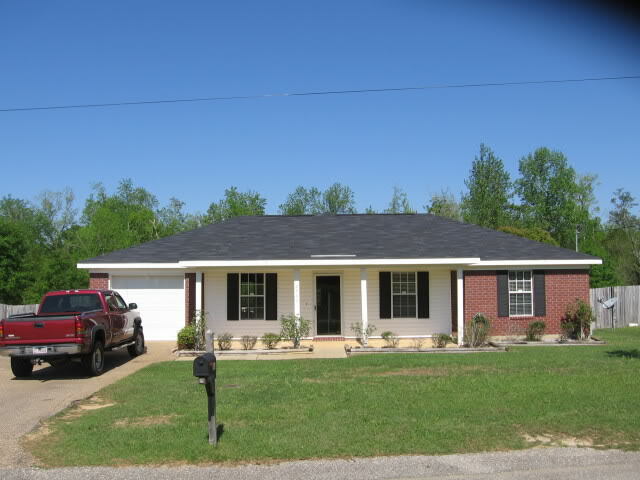 3 bedroom 2 bath home just renovated, with oak hardwood floors. Baker,Causey,Collier school dist, very near ATC Mobile and Superstore; Available in August. Highly rated HUTCHENS/DAWES INTERMEDIATE, CAUSEY MIDDLE AND BAKER HIGH SCHOOL ZONE! Convenient location for US Coast Guard (ATC Mobile and Sector) and Mississippi workers. Built on a quiet cul-de-sac in 2015, this fabulous COASTIE OWNED home in Stillwater has over 2800 square feet of inside living space with 4 bedrooms, 3 full baths and a separate office. 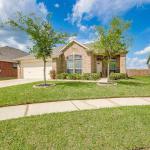 Stillwater is a beautiful community with sidewalks and a private lake. 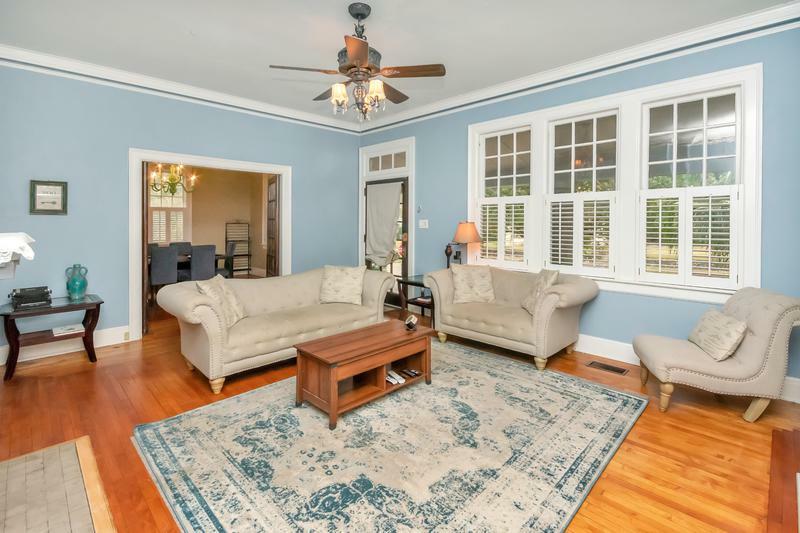 The home features an open concept floor plan with extra spacious rooms, raised ceilings, exquisite columns, molding and trim, and hardwood flooring in the foyer, living room, formal dining room and hallways. 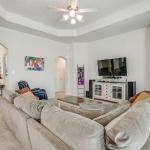 The kitchen has an abundance of custom cabinetry, granite counters, stainless appliances, tile flooring, breakfast bar and pantry, and is open to the living room and informal dining area. You will love the oversize master suite which has room for a sitting or office area. 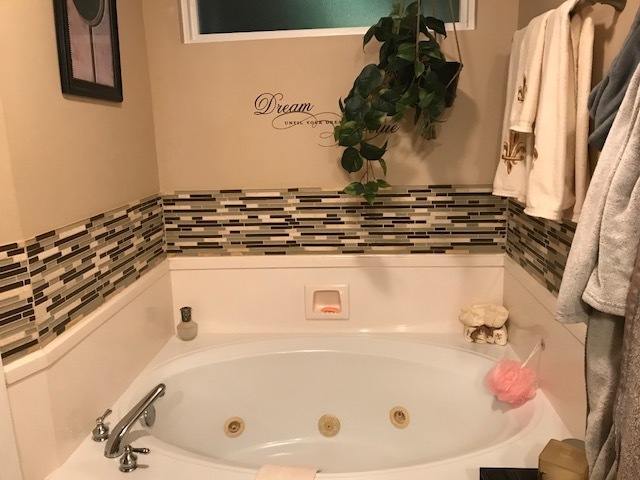 There are two walk in closets, and a lovely bath with granite counters, tile flooring, double sinks, garden tub and separate shower. In addition, there’s a nice size laundry room, extended patio with covered and uncovered space, fenced yard, and an attached 2 car garage. 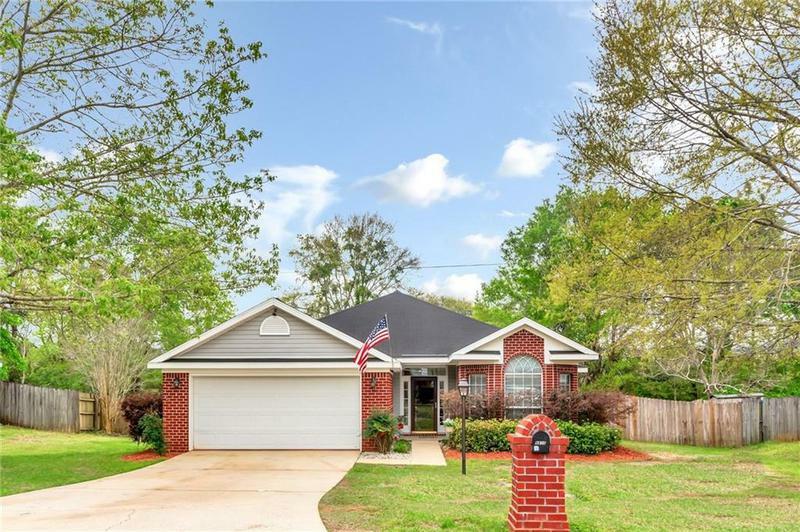 Located in Hutchens Elementary, Dawes Intermediate, Causey Middle, and Baker High school zone, this beautiful COASTIE OWNED home is truly a MUST SEE! Only 13 minutes to the United States Coast Guard Base/ATC Mobile. 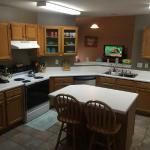 The house has had many updates and has been well maintained. The roof was replaced in 2014. 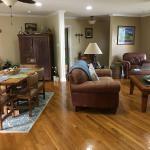 Beautiful hardwood flooring and custom tile flooring is found throughout. No carpet! 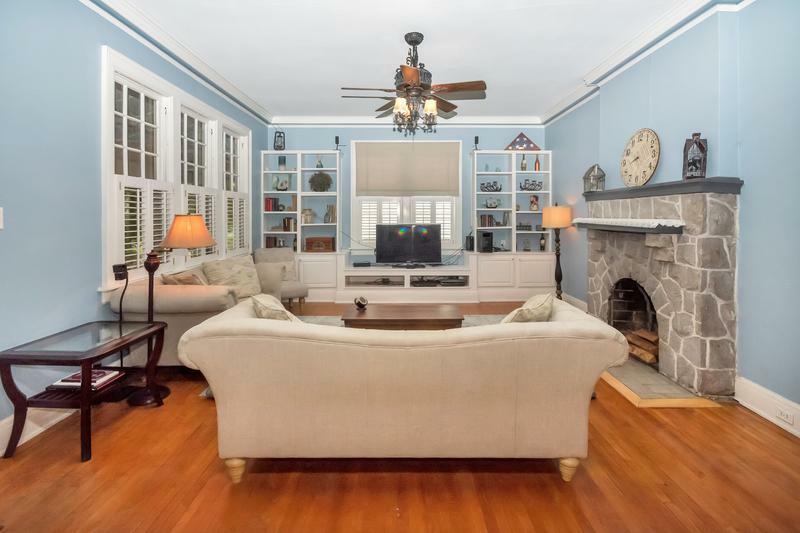 Please notice the custom windows, exquisite heavy moldings, and the inlay tile in the foyer and around the fireplace. 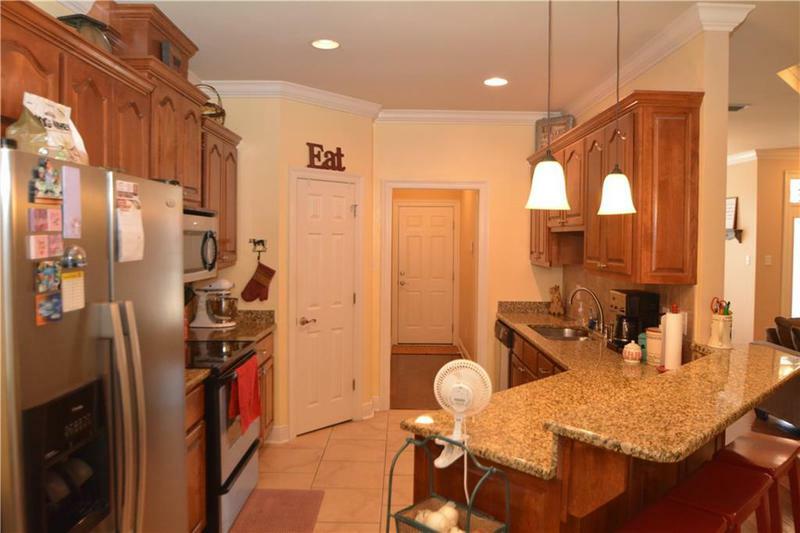 The kitchen, breakfast area, family room and dining room are very open, flowing well for entertaining and family get-togethers. 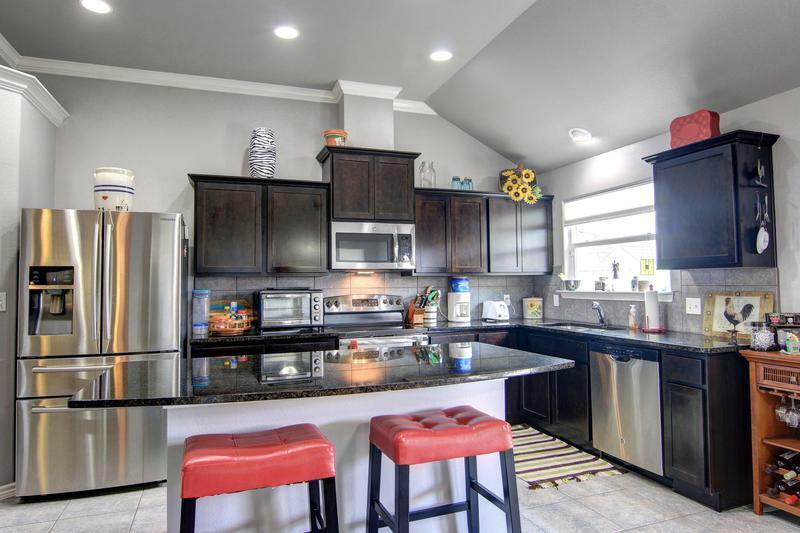 The spacious kitchen has custom cabinetry, granite counters, designer tile backsplash, stainless appliances and a pantry. The luxury master suite includes a bath with oversized whirlpool tub, separate shower, and double vanities. The walk in closet is huge with built-in cabinetry and a built-in ironing board. This house has a split bedroom plan. The master bedroom and bath, along with another bedroom and bath are located on one side of the house. 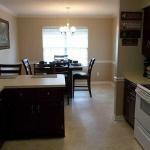 On the other side of the house you will find two more bedrooms and the third full bath. All bathrooms have been updated and have granite counters. 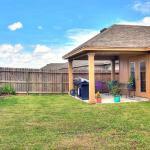 Other features include a double garage, outside storage building, security system, large fenced yard and patio. 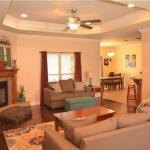 Flat screen tv in the family room and master bath, and all window treatments remain. Fabulous 4 bedroom 2 ½ COASTIE OWNED home in highly desirable Torrington Place! 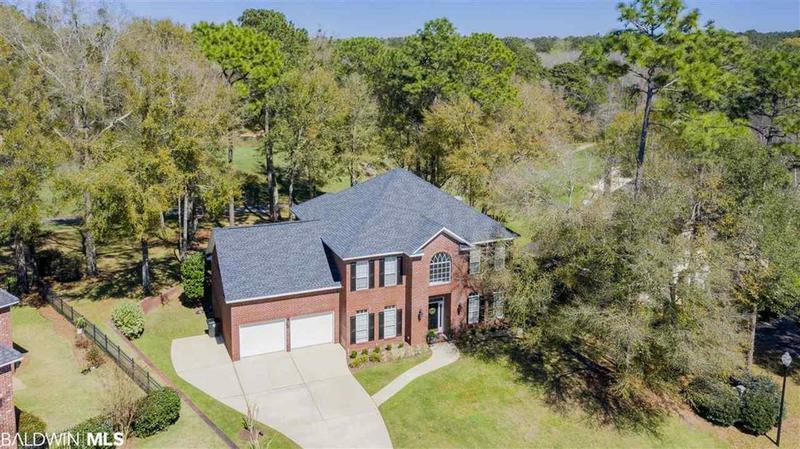 Convenient to sought after schools, and only 7 miles to the United States Coast Guard Base/ATC Mobile! 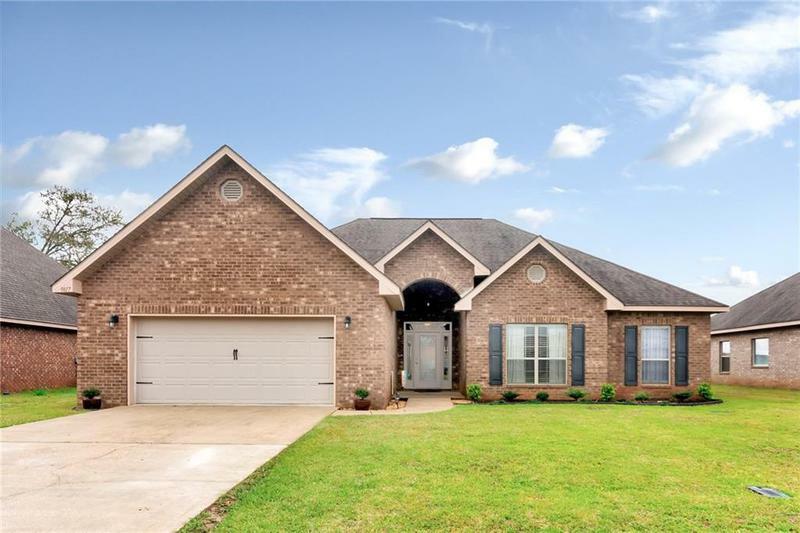 This semi-open floor plan has an extra spacious family room featuring a double sided fireplace, vaulted ceiling, and arched openings that lead into a light filled sun room/bonus room. 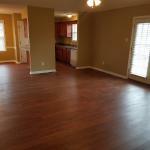 There’s a formal dining room with wood flooring that can be used as an office, TV room, or additional bonus room. 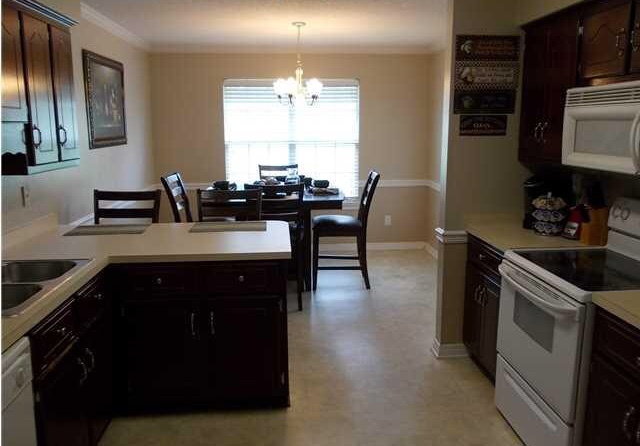 The kitchen offers an abundance of custom cabinetry, breakfast bar, stainless appliances, tile flooring, granite counters, walk-in pantry, and a lovely dining area with two sets of double windows. There’s plenty of room for a large table and chairs. The master suite offers a tray ceiling in the bedroom, large walk-in closet, double sinks in the bathroom, garden tub, and a separate shower. 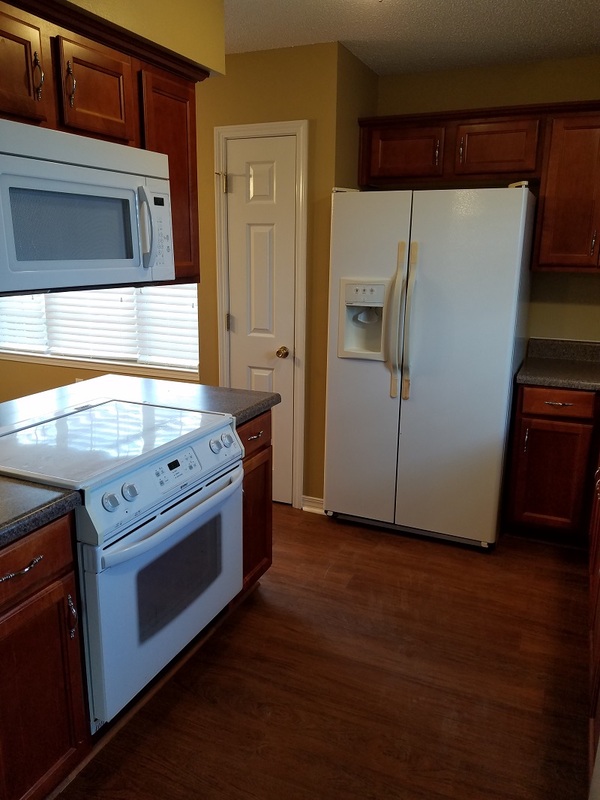 The laundry room with cabinetry is conveniently located near all of the bedrooms. 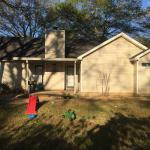 Other special features include a foyer with a coat closet, half bath and mud room as you come into the house from the garage, fenced yard with double gate, 2 car attached garage, and an outdoor metal storage building. 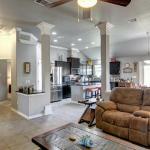 This house is immaculate and move-in ready! 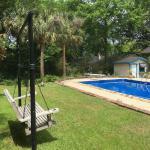 Fabulous Daphne location in highly sought after French Settlement! Just minutes from Daphne East Elementary, Daphne Middle, and Daphne High school. The subdivision is a family friendly community with sidewalks throughout, beautiful landscaping, and a wonderful community pool. 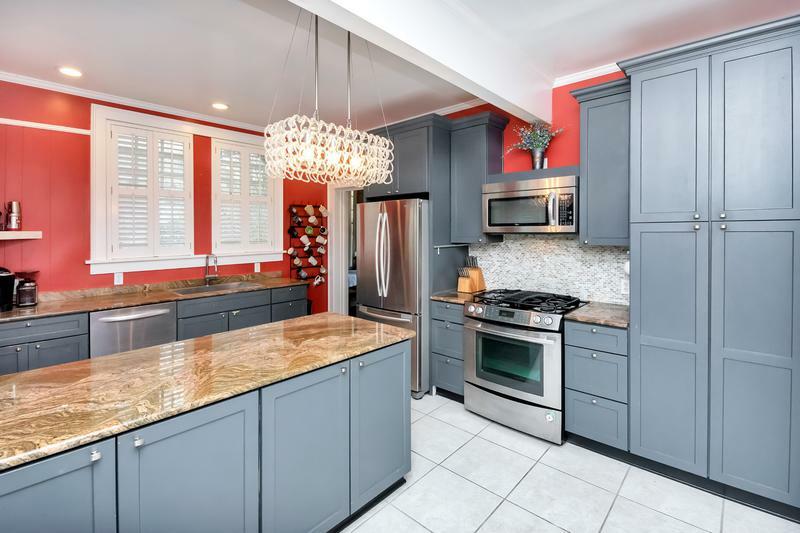 This COASTIE OWNED home has been meticulously cared for, and is immaculate and move-in ready. 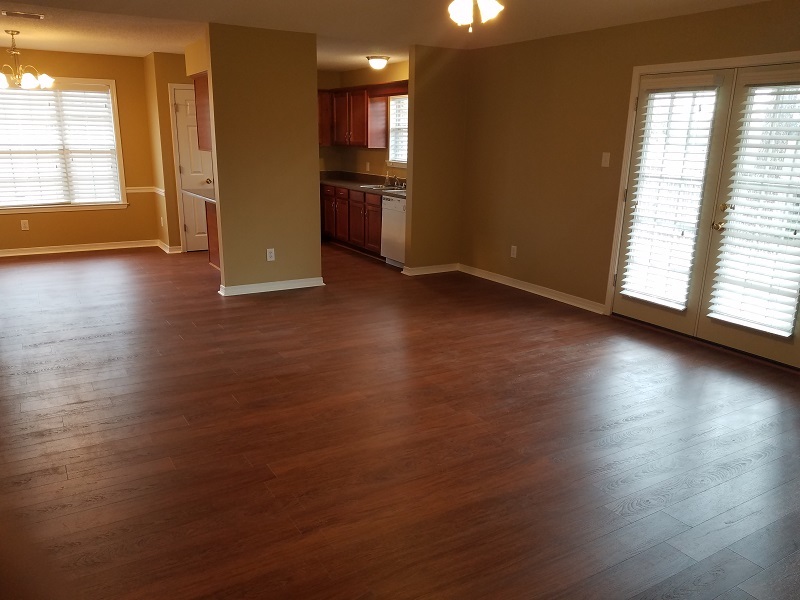 The open concept floor plan is very spacious and has a great flow. 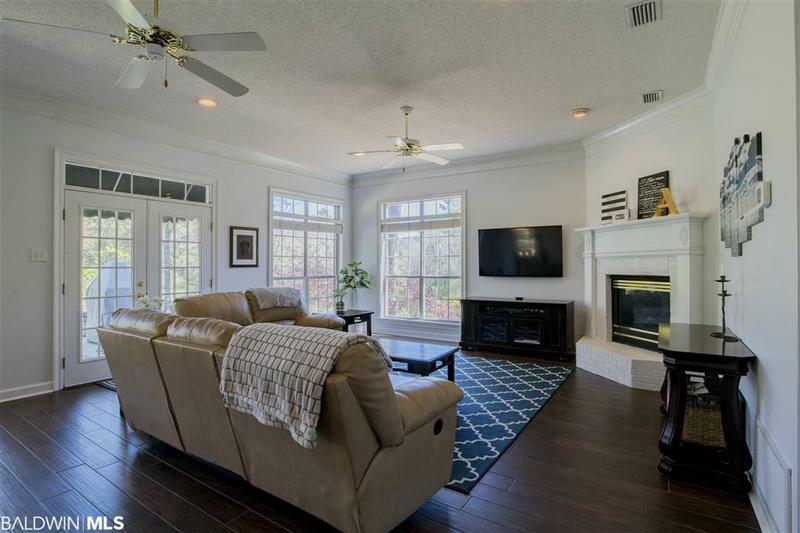 From the inviting entry way you enter a beautiful living room featuring designer hardwood flooring, crown molding, and double openings to the kitchen and dining area. 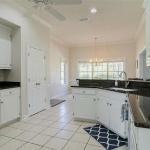 The extra wide kitchen features custom cabinetry, tile flooring, granite counters, stainless appliances, gas stove, walk-in pantry, and a lovely light filled dining area with a French door to the covered patio. 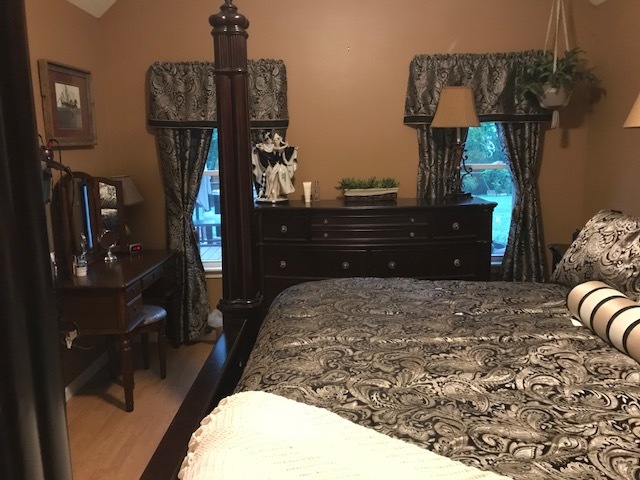 The master suite offers a lovely bedroom with tray ceiling and lots of pretty trim, and a beautiful bathroom with double sinks, garden tub, separate shower, granite counters and tile flooring. 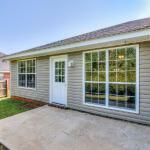 Other special features of the home include a nice size laundry room, mud room, attached 2 car garage, large fenced yard, covered patio, blinds and shades on windows, ceiling fans, energy efficient windows and more. Welcome to Brooklyn’s Way, one of Semmes most sought after locations. 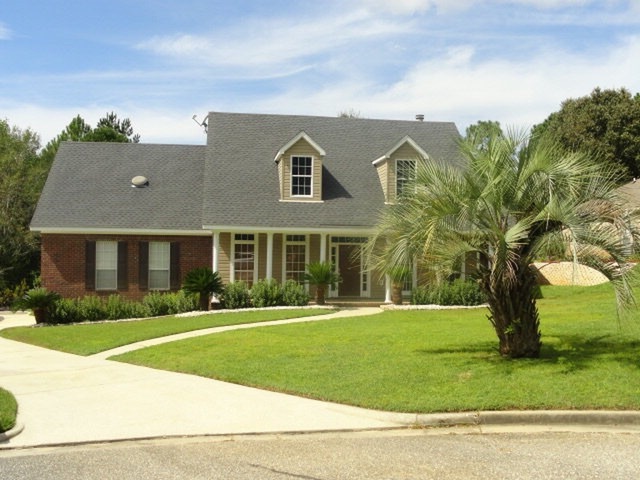 This is a fabulous 5 bedroom 3 bath COASTIE OWNED home with a bonus room/6th bedroom and an above ground POOL! The School zone is highly rated Allentown Elementary, Semmes Middle and Mary G. Montgomery High School! Great location for U.S. Coast Guard workers at ATC Mobile, which is only 7 minutes away! 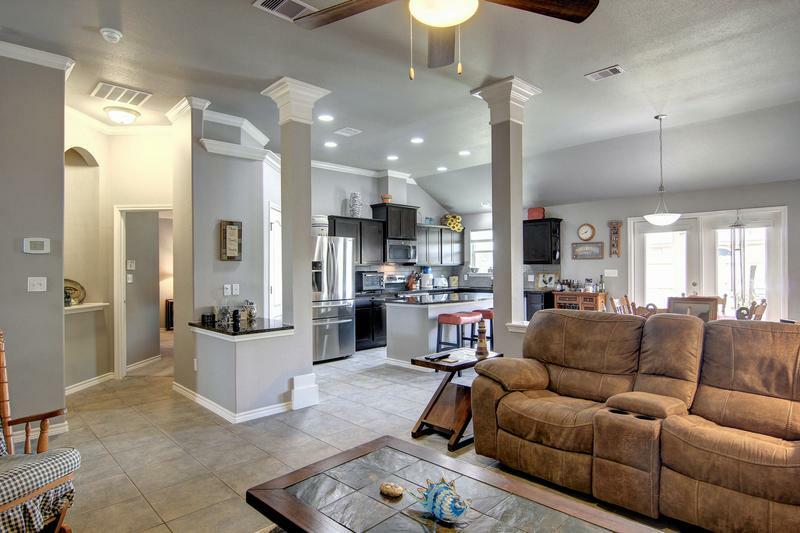 The floor plan of this beautiful home will meet any family’s needs. The first floor features a spacious living room which is open to the dining room and kitchen area. 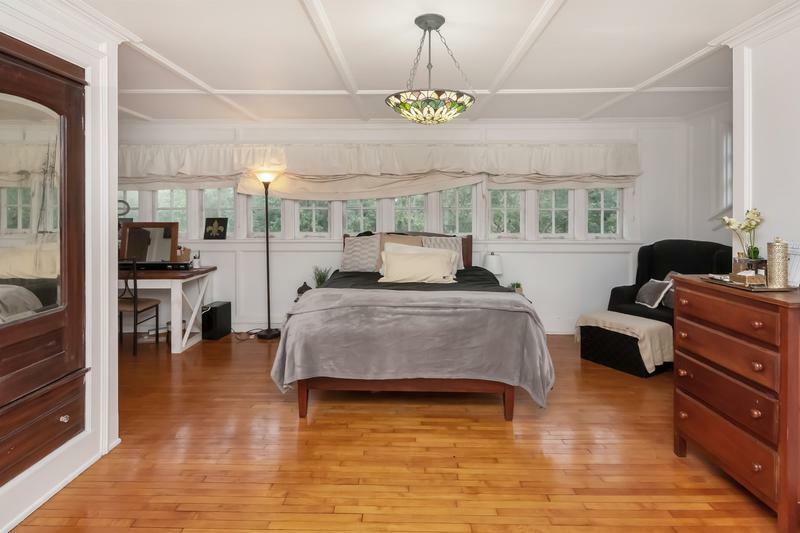 The master suite is on one side of the home, and there are two bedrooms and a full bath on the other side of the house. 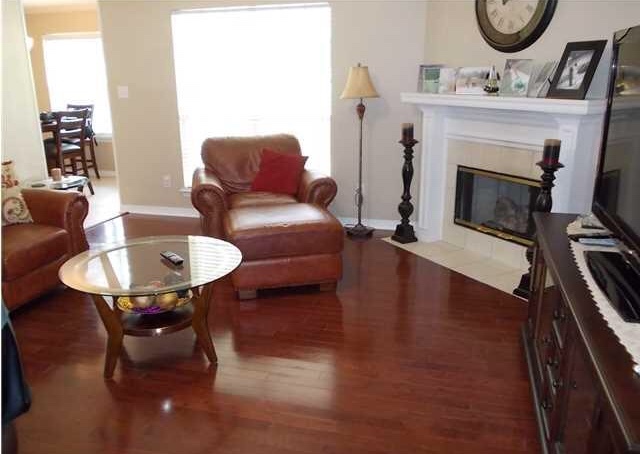 In addition, there is a 4th bedroom/office/bonus room just off the living area. 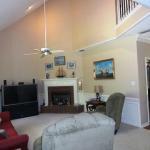 Upstairs you will find another bedroom, full bath, and a huge bonus room/bedroom. 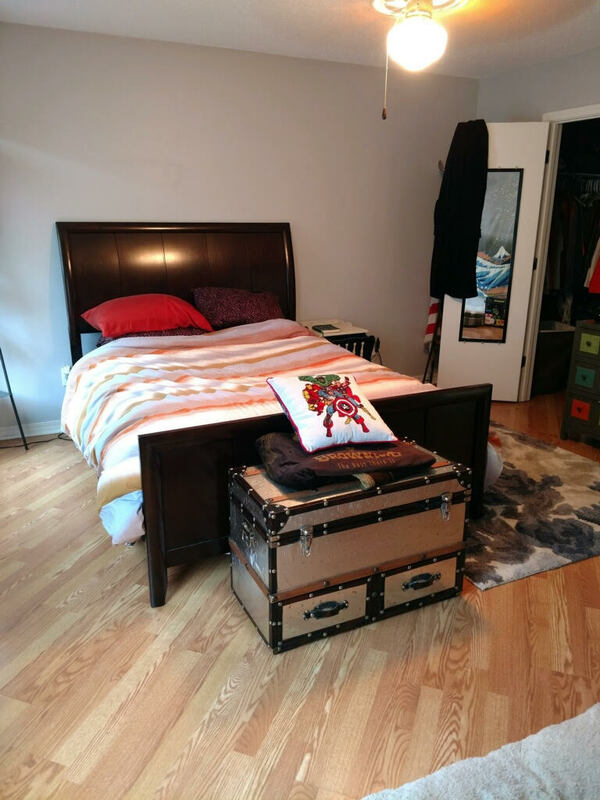 All bedrooms and bonus rooms have closets. The laundry room is on the first floor and there’s an attached double garage. The fenced corner lot is ideal, allowing for garage access from the side of the house. The interior has been freshly painted neutral in color and all of the rooms are filled with light. 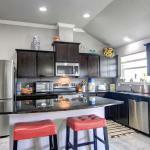 You will love the kitchen which has lots of custom cabinetry, stainless appliances, breakfast bar, and pantry. The master bath features double sinks, garden tub and a separate shower. This is the perfect home for a growing family, and the backyard space is wonderful for spending time with family and friends. 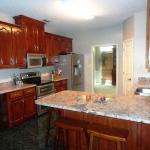 The home has been well maintained and is immaculate. 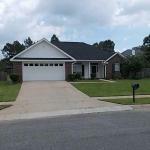 It has wonderful curb appeal, with its nicely landscaped yard and the expansive and inviting front porch. 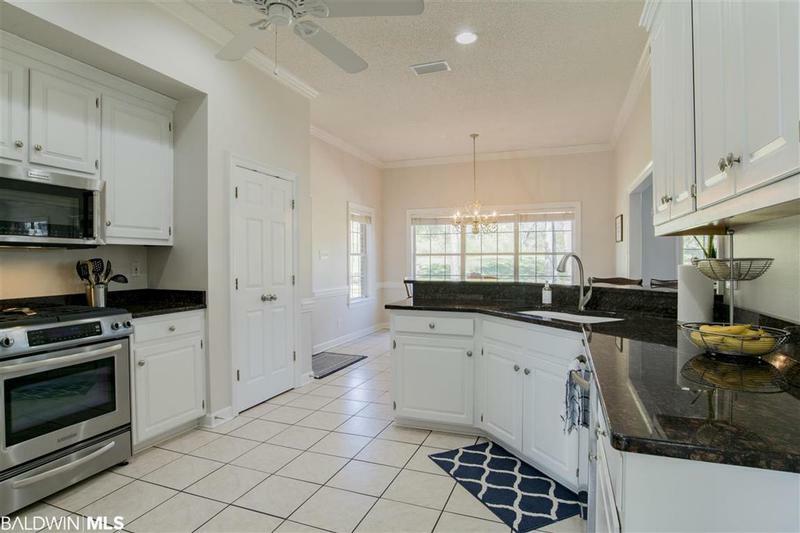 Lots of charm in this 3 bedroom 2 bath COASTIE OWNED home located in highly rated Collier Elementary, Causey Middle and Baker High School zone! Great location for U.S. Coast Guard workers who are stationed at ATC/Mobile or Sector Mobile. 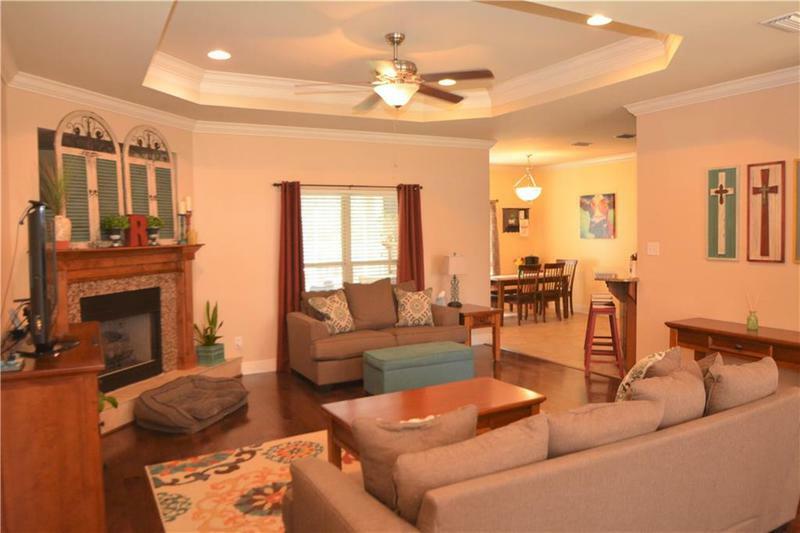 The living room in this open concept floor plan is very spacious and has laminate flooring, tray ceiling, fireplace, and French doors leading to a lovely covered patio. 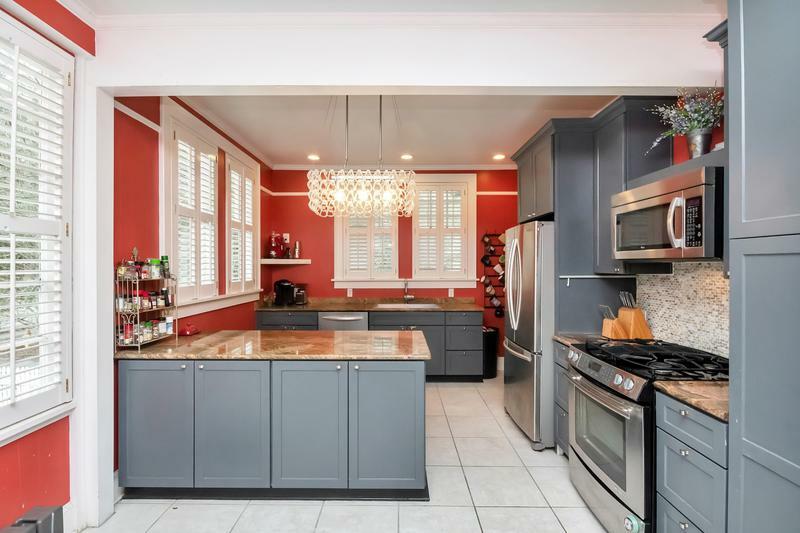 The kitchen which has an arched opening to the dining room, has an abundance of cabinetry, brick floors, breakfast bar, work island, and pantry. 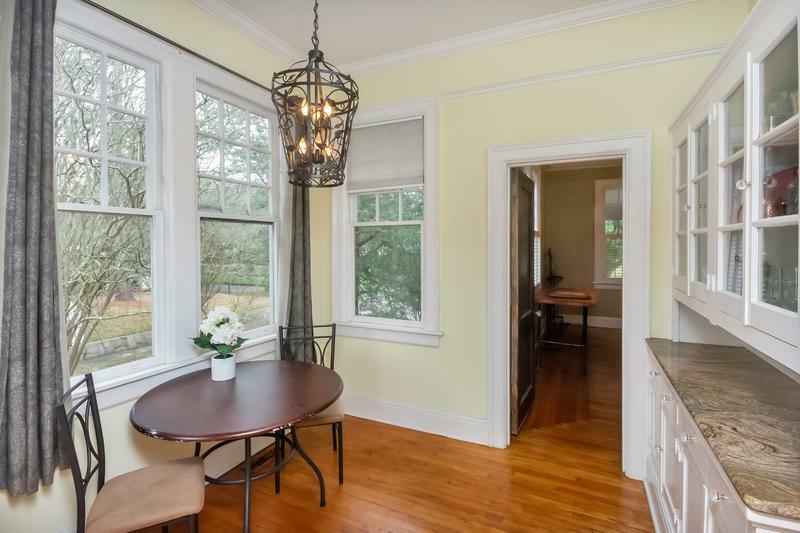 You will love the bay window in the dining room! All of the bedrooms are very nice size. 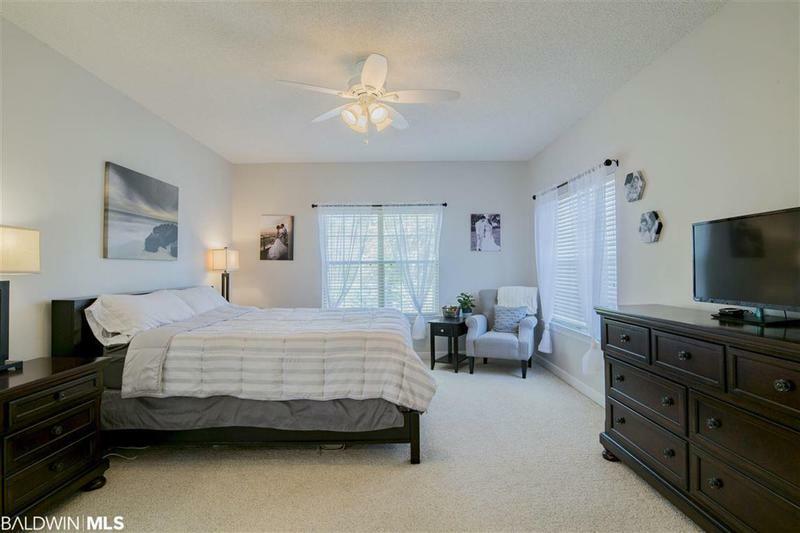 The master bedroom has a tray ceiling and 2 walk-in closets, and the master bath offers double sinks, garden tub, and separate shower. 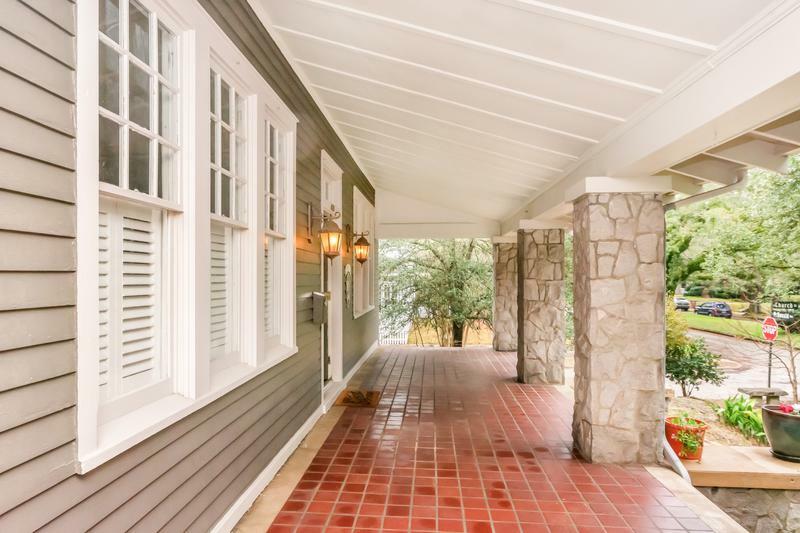 Other special features of the home include a small office/craft room, attached double garage, security system with outdoor cameras, and a huge fenced backyard. All kitchen appliances and the storage building in the backyard will remain. 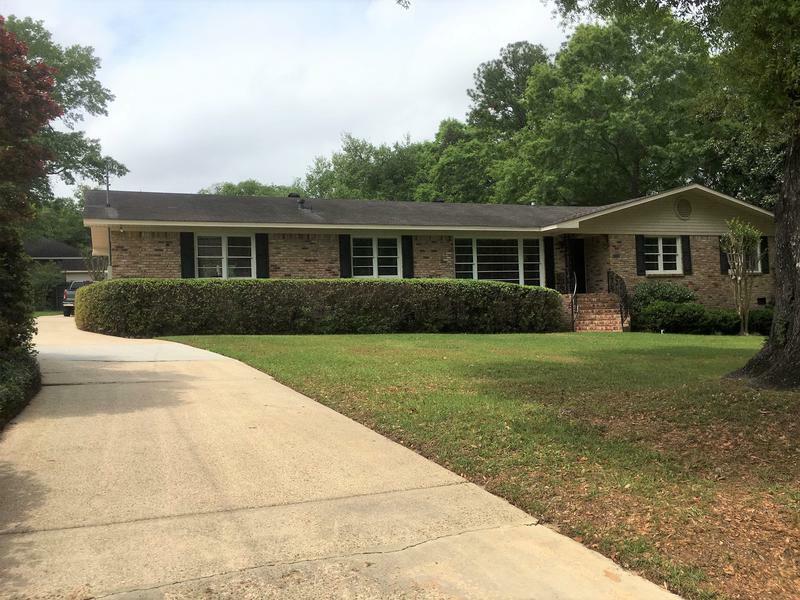 For Lease – 5564 William and Mary Street 36608 - Spring Hill! 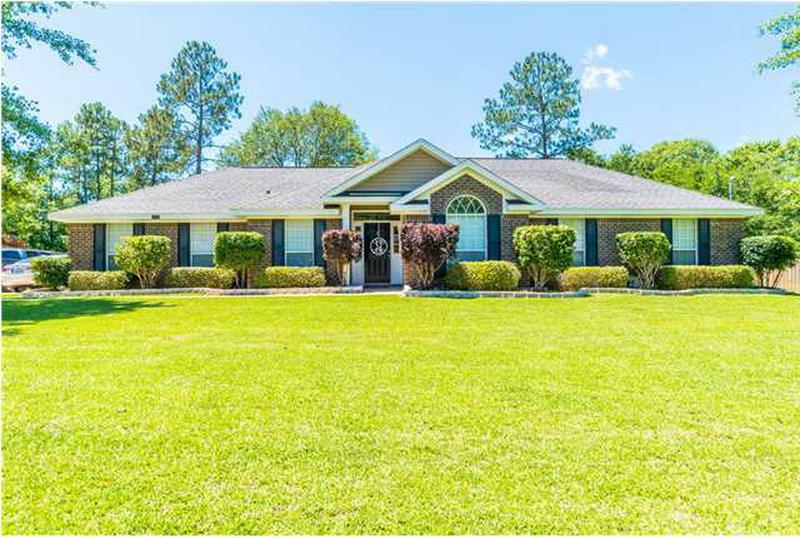 Beautiful 4Bed 3Full Bath 3313sqft home in Fairhope - Niche's #1 place to live in the Mobile Area, All A schools, and Southern Living's top 10 small towns multiple years running. $850 per month, E.R. Dickson school district., and 1.8 miles to Univ South Al. 3 bedroom 1 bath, 2 car garage, 1 car carport. Available June 1. Central Heat & Air. 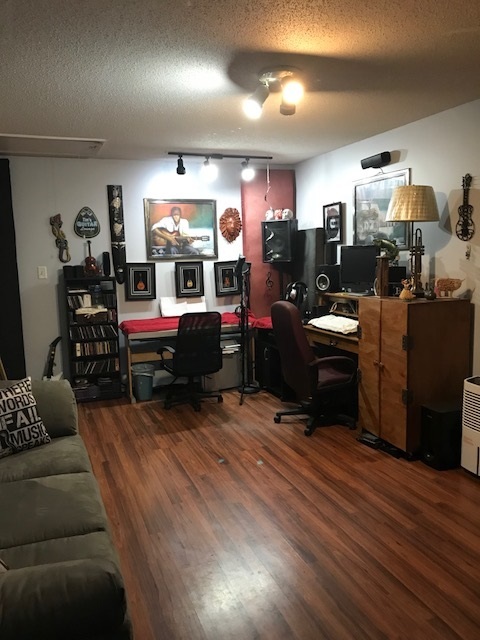 Hardwood floors, remodeled about 5 years ago. 5.7 miles to Airport ATC USCG. 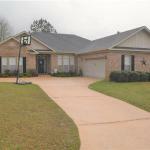 Click the Pics to Email Rochelle about this home! 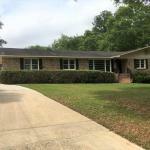 Nice older home (built 1960) close to Midtown (address: 278 Jackson Blvd, Mobile, AL). 15 minutes to Sector / 15 minutes to ATC / 10 minutes to downtown. Close to 65 & I-10. 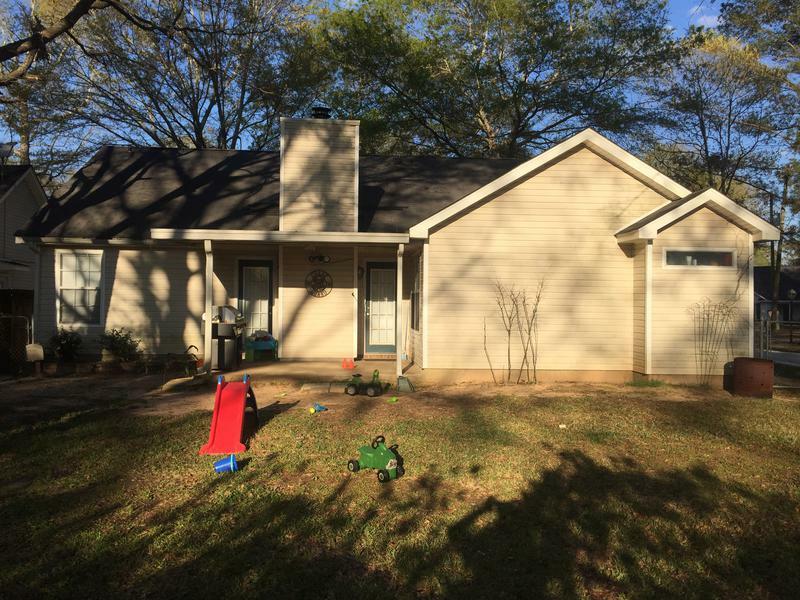 Mature trees in neighborhood with large lots feels like country, yet only minutes from any kind of shopping or restaurants. 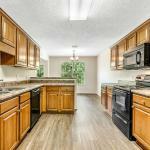 Home tastefully updated throughout. Features: 1800 sq ft brick home, three beds, two baths, hardwood floors in living room and hall, ceramic tile in kitchen and bathrooms, newer carpet in bedrooms, all stainless steel appliances, granite countertops, two car garage in back of house with large parking pad, tool shed with well, pool house with outdoor shower and bathroom, in-ground pool, covered patio, mature landscaping, lawn irrigation system, and many other features. 20 minutes away from Ellington Field Joint Reserve Base and 30 minutes away from USCG Galveston, and USCG Marine Safety Unit Texas city is right around the corner from the home.